Description: CD Calendar Cases are plastic desktop calendar holders ideal for holding calendars, recipes, artwork, portfolios, retail products and a variety of other promotional items. 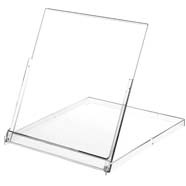 Unlike standard CD Jewel Cases, CD Calendar Cases fold back to form a tabletop calendar display stand. Case Size: 5.59" x 4.98" x 0.36"
Insert Size: 5.432" x 4.642"